The 13B engine is widely known Mazda Wankel engine. It was produced over 30 years and offered for many Mazda’s models including the RX-7 - legendary Japanese sports car. This Mazda rotary engine has a two-rotor design like its predecessor the 12A. Mazda following the tradition has left the radius of rotors unchanged (starting from the 10A engine). The thickness of rotors was increased to 80 mm (3.1 in). The 13B looks like a lengthened version of the 12A in this case. The total displacement of two chambers is 1308 cc (1.3 liters). The first 13B engines had carburetor fuel system and single distributor in the ignition system. Cars using this engine used the AP name (1974-1980). In the future, the engine was switched to injection. The 13B-RESI engine (Rotary Engine Super Injection) got Bosch L-Jetronic fuel injection system in 1984. This engine also received a unique intake manifold with two-level intake box which provided a supercharger-like effect from the Helmholtz resonance. The new technology significantly improved power and torque of naturally aspirated 13B engines. The output of 13B-RESI is 135 hp (101 kW) and 130 ft-lb (180 Nm). The second generation RX-7 came with 13B-DEI engine. This non-turbo engine was equipped with the 6PI, DEI systems, and four-injector electronic fuel injection. The 13B-DEI is a little bit more powerful: 146 hp (109 kW) at 6500 rpm and 138 ft-lb (187 Nm) at 3500 rpm. The 13B-T has a single twin-scroll turbocharger and the four-injector fuel injection from the 13B-DEI. There are not variable intake and 6PI systems. The 13B-T engine features the four port intake design which similar to early 13B engines from 70’s. The use of a turbocharger gave the noticeable improvement in torque. The output of late 13B-T was 185 hp (138 kW) at 6500 rpm and 183 ft-lb (248 Nm) at 3500 rpm. 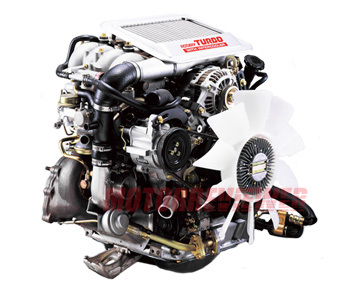 The 13B-REW engine was a completely redesigned 13B engine, launched in late 1991 in the third-generation RX-7. The REW indicates that it is a rotary engine supercharged by twin sequential turbochargers. This is the first engine in the mass-production with such turbocharger system. The 13B-REW got two big Hitachi HT-12 turbos. The second turbo receives a full share of exhaust flow and adds its boost with the primary turbo after 4,500 rpm. The 13B-RE from the JC Cosmo series has a large Hitachi HT-15 (57 mm diameter turbo) as primary with a smaller Hitachi HT-10 turbo (51 mm diameter). The small one provides the boost from 1,500 rpm up to 4,500 rpm where the bigger turbocharger designed for higher rpm starts boosting up to 8,000 rpm. This tandem minimizes the turbo lag very well. The 13B-REW was equipped with hardened apex seals to manage the high boost and additional loads. There are thin wall cast-iron rotors, four platinum-tipped spark plugs (two per rotor), a free flow exhaust, enhanced cooling, revised intake and better lubrication system. The engine management system has new data parameters for better monitoring and controlling of air/fuel ratio, ignition timing and boost pressure. The 13B-REW was fitted with standard with an air-to-air intercooler. At the beginning of sales, the engine produced 255 hp (190 kW) at 6,500 rpm and 217 ft-lb (294 Nm) of torque at 5,000 rpm. In 1993 the power was increased up to 265 hp, and since 1999 the engine output was 280 hp. The production of the 13B-REW engine was continued up to 2003. The engine is unique and still very popular among tuners and sports teams in various types of racing competitions. 9.0:1 - 13B-REW and 13B-RE. 10w-30/synthetic 5w-40 - 13B twin turbo rotary engine. 3.3/3.5 - 13B twin turbo rotary engine. Rotary engines are not practical for a daily driver period. The cars with 13B are not best in fuel economy, require more care. There is a reason those engines are used in the racing primary where durability isn’t the critical factor. But the 13B can be as reliable as a piston engine. It needs regular maintenance and proper oil and good quality gas. The engine burns oil, and this is how the engine is designed to operate. The oil consumption this causes misunderstanding among car owners. The little oil injectors inside inject oil into the combustion chamber which lubricates and prolong the life of the apex seals. So it is essential to keep an eye on oil level and oil pressure. The simplified method of extending the engine life is premixing oil in the gas. Premixing is the addition of sacrificial lubricant to the fuel for the engine. That allows deleting the oil metering system entirely. But premixing is even suitable for 1989-91 RX-7 with the electronically oil metering system which provides 25% less volume of oil compare with 1986-88 models. The second important task is preventing the overheating. The engine is sensitive to coolant leaks, and thermostat fails. Change the coolant and thermostat every 12-18 months. Use an OEM (Mazda) thermostat. Inspect the hoses and belts too.